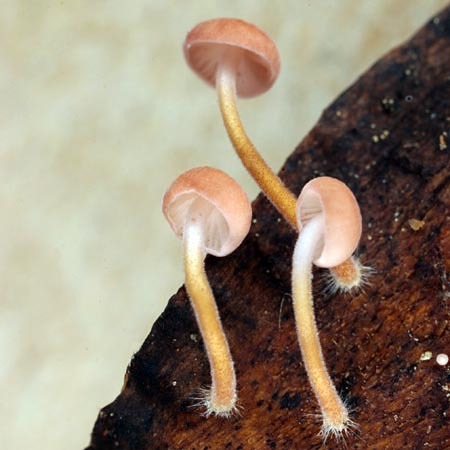 Cap 1.5-4.0 mm broad, at first hemispheric to convex, broadly convex in age; margin incurved, then decurved, minutely fringed; surface when moist, faintly striate-rugulose to near the disc, pubescent with a hand lens; color pallid, pale-pink, tan, to tawny-brown, occasionally olive-brown, the disc darker; context membranous, colored like the disc; fruiting body reviving after drying; odor and taste not distinctive. 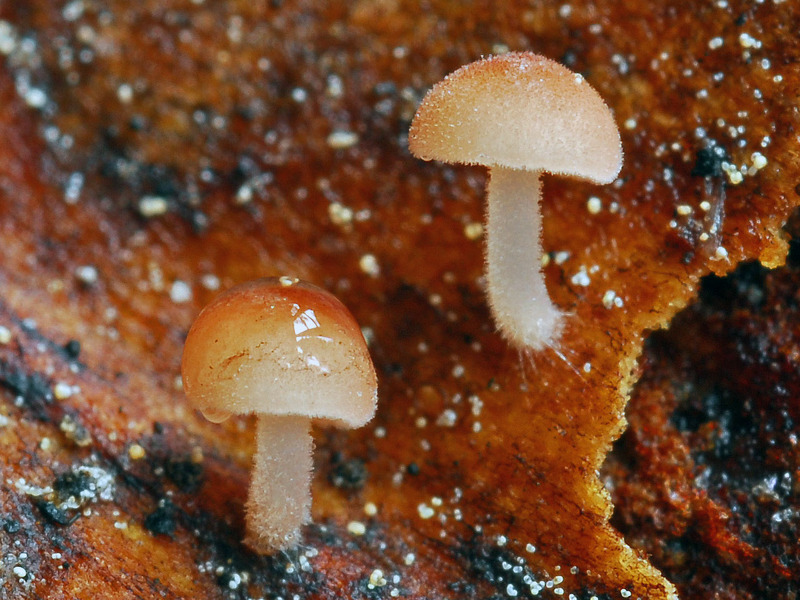 Gills adnexed to adnate, subdistant, relatively thick, watery-white, edges fringed; lamellulae in two to three series. Stipe 1.0-3.0 mm long, 0.5 mm thick, round, solid, straight or with a basal curve, equal to enlarged at the attachment point, sometimes anchored with radiating whitish hairs; surface pubescent, whitish to pale-tan, frequently tawny-brown to dark-grey below; partial veil absent. Spores 4.5-5.0 x 2.5-3.0 µm, ellipsoid, thin-walled, slightly inequilateral in profile, hilar appendage conspicuous, hyaline in water, inamyloid; spore print not seen. Gregarious on rotting cones of Pinus lambertiana (sugar pine), Pinus jeffreyi (Jeffrey pine), and Pinus ponderosa (Ponderosa pine), most commonly on sugar pine; found in montane regions in the spring shortly after snow-melt; common on its preferred substrate. 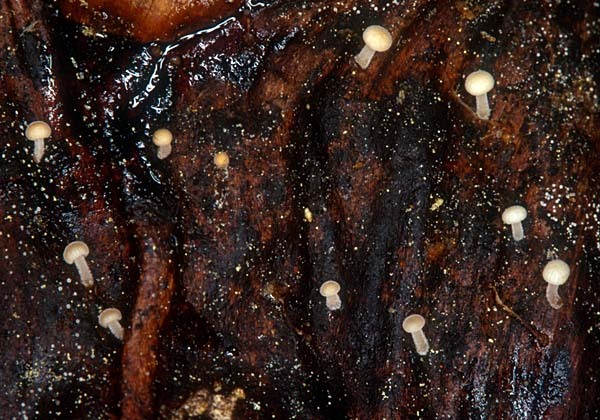 Strobilurus diminutivus shares a feature common to the genus (except for Strobilurus albipilatus), i.e. a cone-dwelling habit. 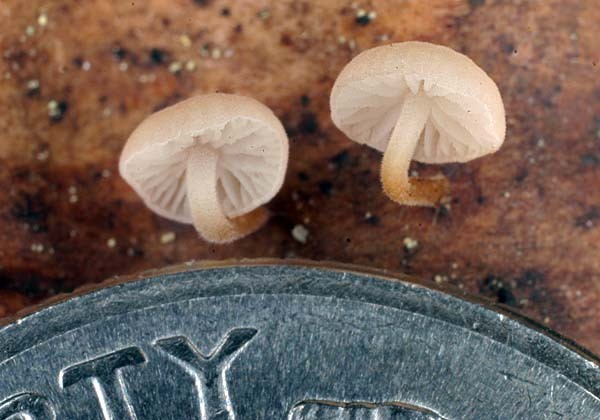 A dozen tiny sporocarps may occupy a cone scale and hundreds may be found on a single cone of Pinus lambertiana (sugar pine). 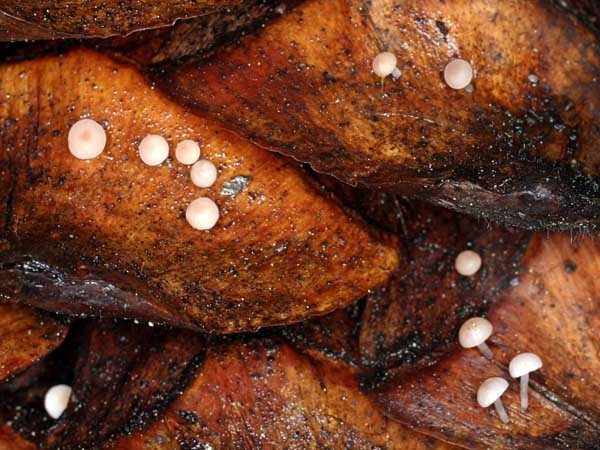 Despite this abundance, it is rarely collected because most fruitings are well hidden by overlapping cone scales. 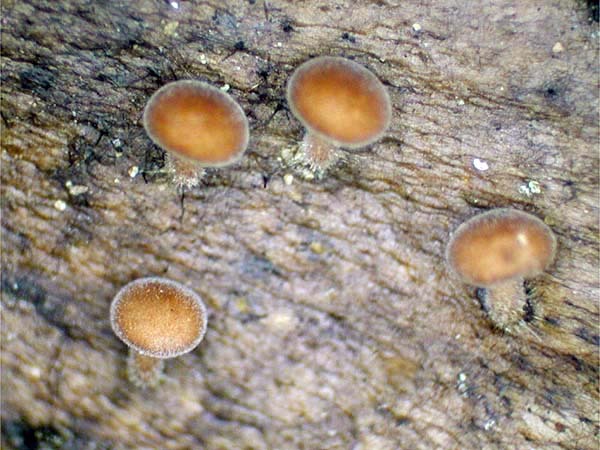 Strobilurus diminutivus is recognized by a pallid, pale-pink to tawny or dull-brown cap. 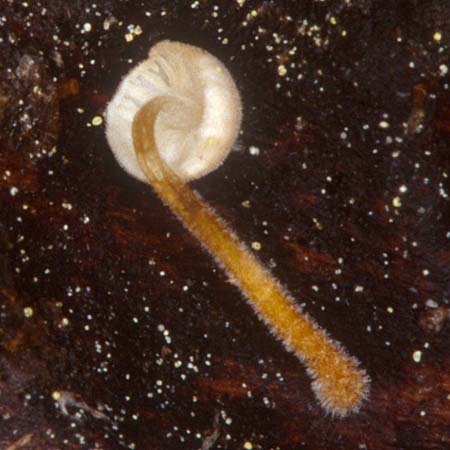 The cap and stipe often have a fuzzy aspect when viewed with a hand lens due to the presence of cystidia. 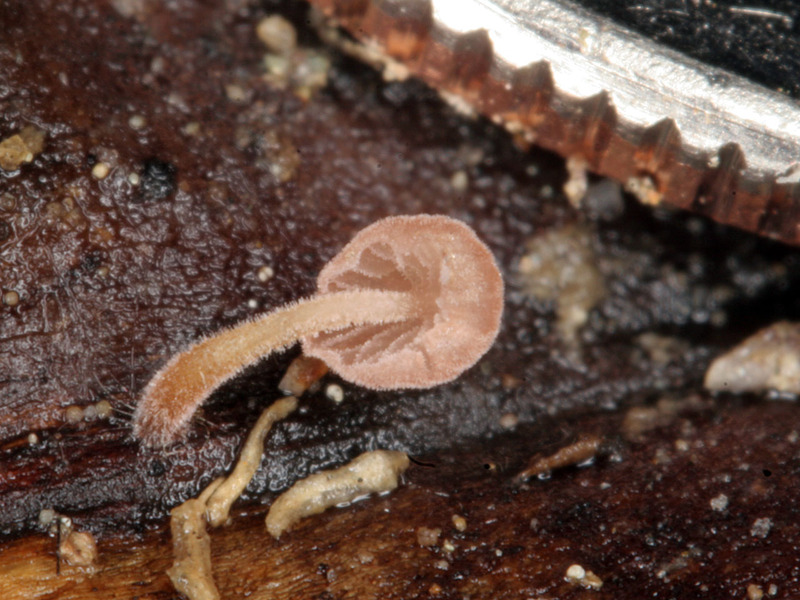 Strobilurus diminutivus is the only member of the genus in California that has the ability to revive after drying.